Windows - Energy Star or Thermal Windows? Sometimes people use the words thermal windows and Energy Star windows interchangeably. However, thermal windows are not necessarily Energy Star windows. How can you know? Energy Star windows will always be labeled with an NFRC label showing the Energy Star designation. It is very important that you ask about the NFRC rating for any window you are purchasing. This means that the window has been check independently and certified by the National Fenestration Rating Council (NFRC). If you are investing in replacement windows, you want to know that they are quality and the best in insulated window for energy efficiency standards, not merely rated internally. U-factor is the rate at which a window, door, or skylight conducts non-solar heat flow. It's usually expressed in units of Btu/hr-ft2-oF. For windows, skylights, and glass doors, a U-factor may refer to just the glass or glazing alone. 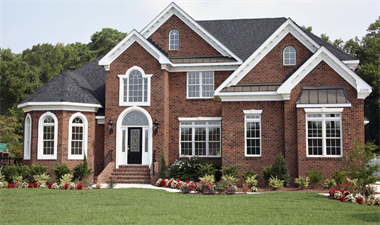 NFRC U-factor ratings, however, represent the entire window performance, including frame and spacer material. The lower the U-factor, the more energy-efficient the window, door, or skylight. Solar heat gain coefficient (SHGC) is the fraction of solar radiation admitted through a window, door, or skylight -- either transmitted directly and/or absorbed, and subsequently released as heat inside a home. The lower the SHGC, the less solar heat it transmits and the greater its shading ability. A product with a high SHGC rating is more effective at collecting solar heat during the winter. However, in the South Central Climate Zone that we are in, we have more cooling days than heating days and need lower values to gain greater benefit. A product with a low SHGC rating is more effective at reducing cooling loads during the summer by blocking heat gain from the sun. Your home’s climate, orientation, and external shading will determine the optimal SHGC for a particular window, door, or skylight. Air leakage is the rate of air movement around a window, door, or skylight in the presence of a specific pressure difference across it. It's expressed in units of cubic feet per minute per square foot of frame area (cfm/ft2). A product with a low air leakage rating is tighter than one with a high air leakage rating. R-Value According to the U.S. Department of Energy's Guide for Selecting Windows for Energy Efficiency, “The insulating value of an entire window can be very different from the glazing (glass package) alone. Instead, look at the certified NFRC “U” value for the entire window unit. The lower the “U” value the better the window will insulate.